Add-on adds a new option in each post's menu to save its screenshot (with all replies expanded). There is an option for anonymization. Large posts are split into multiple images. 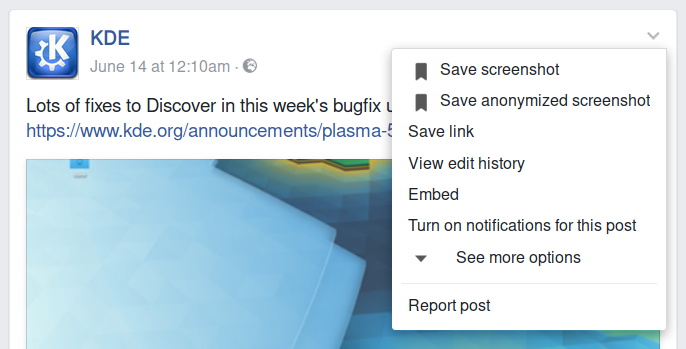 Facebook Post Screenshot is a Firefox web extension to save Facebook posts as images. Add-on adds a new option in each post's menu to save its screenshot (with all replies expanded). Screenshot can also be anonymized (profile pictures blurred, names replaced with identifiers like "OP", "Profile 1", "Profile 2" and so on). Large posts are split into multiple images each at most 8192 px tall (this can be changed in options up to 16000 px). The code is open source and available on GitHub. If you're interested, check out also my other projects.